David Christian had little idea what was in store when he stepped on the set of The Colbert Report in November 2013. Having lived in Australia for years, Christian wasn’t familiar with the show and its special brand of political satire. And yet, sitting across the table from Stephen Colbert — a perfectly placed Colbert Nation mug between them — Christian smiled at the host’s prodding. Christian laughs heartily. And then cuts through the moment to posit his idea. The idea will sound familiar to anyone who has seen Christian’s must-watch talk from TED2011, in which he gives a history of the world in 18 minutes. 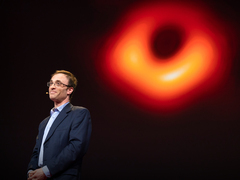 In this fast-moving talk, Christian pivots through 13.7 billion years of history, telling a story of how the world — against all odds — became a place of 7 billion humans interconnected in highly complex ways. Christian calls his approach “Big History.” And, at the time, he wanted to bring it to high school students. For Christian, Big History now forms a large part of his personal history. The idea began in 1989, when he was a young Russian history professor at Macquarie University in Australia. In 2008, Christian connected with an avid champion of Big History: Bill Gates, who’d found the course while looking for online classes to take with his kids. The two decided to work together on developing a Big History course for high school students. In 2010, they hired project manager Michael Dix to launch the idea. The next year, Gates invited Christian to speak at TED during a session he guest-curated. Christian’s talk was a true group effort — it was co-written Dix and Gates, and featured gorgeous imagery created by Ian Sands. It got a standing ovation. And as he stepped off the TED stage, Christian was excited to see Twitter afire with people referencing his talk. The momentum of the TED Talk helped Big History take off from there. Within a year, six high schools in the United States started teaching the class, which used short, 7-8 minute videos to tell the story of time and space. Two schools in Australia followed suit. It is perhaps a rarity for a professor to stick with one course for 20+ years, and to bring it to high schools. But Christian senses a unique need for Big History. While Christian is not involved in the H2 television series, he is still very much a part of the Big History project and is excited about the publicity that the television series is generating for the larger concept. And while he thinks it’s great that Big History has reached 150 high schools, he knows it’s a long road until it becomes a part of everyone’s education. Note: Despite what Stephen Colbert says, David Christian is not actually the host of H2’s show, Big History. He does appear as a talking head in the series, though, and is also the originator of the idea.